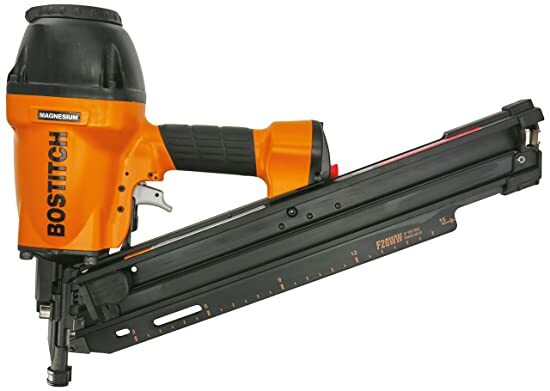 Framing nailers are power tools known for their versatility and ease of use for any kind of finishing jobs. They have become very affordable and this makes them an easy choice over the regular hammer for many. However, their popularity easily leaves consumers faced with hundreds if not thousands of different models, each claiming to be the best. We have handpicked three models from an industry-leading label – Bostitch. Our Bostitch framing nailer reviews will give you in-depth information on 3 Bostitch framing nail gun we consider to be the cream of the crop from this particular brand. 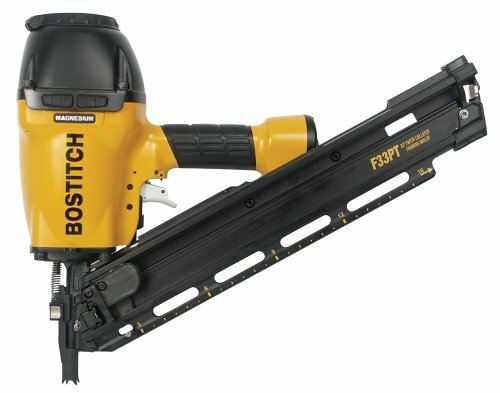 Bostitch is known to manufacture high-quality, durable framing nailers and their products are used by professionals and amateurs throughout the world with zero complaints. If you want to buy a nailer, here are some reviews that I recommend you to read such as Bostitch F21PL, Bostitch F28WW, Hitachi framing nailer, Paslode 902600, Hitachi NR83A3, Porter Cable FR350B, Hitachi NR90AE, DeWalt DCN692M1. The Bostitch F21PL fires round head nails ranging from 1.5 inches anywhere to 3.5 inches. This framing nailer is handy for those who are required by law to use round head nails instead of clip heads. It is fully enclosed in a lightweight magnesium housing bringing its overall weight to a comfortable 9.1 pounds. It can definitely pack a punch with its 1050 pounds per inch, allowing it to nail even through the toughest of material. What we really like about the Bostitch F21PL is the ability to change nosepiece on the go – and you can easily switch between metal or 21-degree nails for finishing jobs. Best of all, it is a portable framing nailer that is easily held with one hand with really comfortable rubber grips. This ensures long hours of usage without hand fatigue. The Bostitch F28WW is one of the most versatile nailers out there and is regarded as an industry standard by many professionals. It has the same features as the F21PL reviewed above with the exception of firing clipped head nails instead of round head. Its 16 inches stick scale makes is handy when you want a quick visual on the nail magazine. What we like about this model is definitely its weight. At only 7 lbs, this power tool is extremely versatile and can be used to nail in tight spots without any significant burden on the user. Best of all, it has a great trigger mechanism that allows you to bump fire or fire in sequence depending on how much force you apply on the trigger. Whether you want accuracy or speed, this model has you covered. 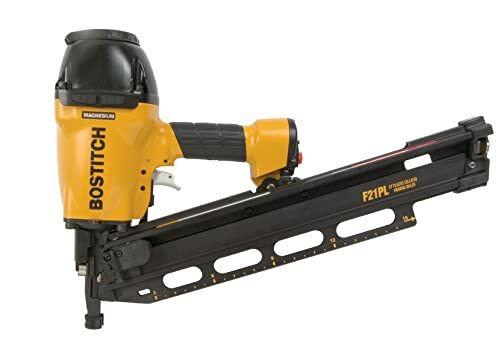 This Bostitch framing nail gun is a 33-degree paper tape framing nailer that can also be used as metal connector nailer. It comes with a special penetrating tip that accurately drives metal connector nails ranging anywhere from 1.5 to 2.5 inches on joist hangers. It is air powered and will, therefore, require an external air compressor. However, this greatly adds to its ability to drive framing nailers or metal connector nails into almost anything like butter. This model accommodates a wide range of framing nails, including Paslode nails that are sold in almost any hardware store online or offline. With its lightweight 8.8 lbs, we feel that this Bostitch framing nail gun has the perfect weight for a framing nailer – as it is neither too light nor too heavy and is most certainly one of the best Bostitch framing nailer around. This model is a heavy-duty power tool geared mostly for professionals, but weekend warriors will immediately feel right at home with it. Its price and feature ratio makes it a best buy for anyone looking for a powerful framing nailer that retrofits as a metal connector nailer. When looking for the best Bostitch framing nailer, there are some factors to take into account. Its ability to fire nails into a tough material and its weight play a key role in the long-term benefit of your nailer. The 3 models from our Bostitch framing nailer reviews above take all those factors into account and will guarantee you years of usage without any fatigue. Best of all, they are manufactured by a reference brand in framing nailers so you can rest assured that you are only buying the best of the best. To find if they are the best framing nailers for you, make a list of their features and see if they fit into your need and work requirement. If they do, chances are those Bosch framing nail gun will over deliver in the workplace. Hitachi NR90AE Review – Should We Buy This Framing Nailer?